Most restorers of early keyboard instruments have been faced with the problem of removing pins from bridges where the pin is broken off flush with the bridge, or have been faced with the problem of jack pivot pins that must be removed for one reason or another, where the original holes for pins were not drilled right through the jack, making removal a nightmare of using fine saw blades and brute force. There is a solution. It is possible to buy a fine hollow tube, one end of which has been dipped into diamond dust. They are available from suppliers to the jewelry trade (for example H S Walsh & Sons Ltd, 0121 8778 7061), and are called ‘Diamond Impregnated Drills’ or ‘Tube Drills’; the size I’ve found good is Walsh’s Ref. TD762 (priced at around £5.50 each in 2002) which has an outer diameter of 1.93mm. The inner diameter is such that it follows the pin without destroying it, at least at high speeds. This type of drill is slightly flexible even when run at 4500rpm in my high-speed drill press. I clamp the jack in a vice on an X-Y table to centre it under the drill, which follows the pin nicely. Do not drill right through the side of the jack body! A pair of fine nosed pliers can be modified to fit into the hole and grip the pin (I file a groove along the centre-line of the inner faces) to withdraw it cleanly, and the tongue can be removed. The tube drill is now exchanged for a drill bit, suitable sized for the intended re-placement pin (I use soft iron dressmakers’ pins, available in a variety of small diameters). The hole can be extended right through the jack, using the last bit of the original hole as a guide. 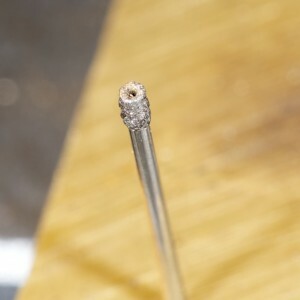 The outer diameter left by the tube drill is just under 2mm, which allows you to glue in a dowel made from a wooden toothpick. Handy, eh! Then, when glue is dry, the jack is re-aligned under the drill-bit and the hole back-drilled through the dowel. I have used these drills successfully free-hand, in the chuck of my pendant drill (at 20,000rpm) to drill around pins broken off in the bridges of early pianos, but it does require the hand to be steadied carefully, and aligned with the angle of drilling of the adjacent pins. To know this angle, an adjacent undamaged pin should be raised or re-moved; all too often pins have been bent after fitting, disguising the alignment of the drilled hole. I imagine a light weight re-chargeable drill might work, although the speed is rather slow for a drill with no real teeth. Still, these drill bits afford a relatively controlled way of effecting repairs that have often been made by what amounts to butchery, and therefore deserve a place in our tools. Actually, until reminded I’d forgotten that the first time I used this method was to replace bridge pins on the Clementi Upright Grand in Kenneth Mobbs’ collection; a number of the brass bridge pins had been broken off more or less flush with the bridge. This method worked perfectly. I’m sure that everyone has their own best method of plugging and re-drilling holes for tuning pins, either to re-position a few pins, or to replace a set of zither pins with a more traditional and smaller pin. I encountered this while working on the Spanish instrument which started off life as a piano in the early part of the eighteenth century until it met Arnold Dolmetsch, who ‘converted it back’ into a harpsichord. The most difficult aspect of this particular restoration was to deal with the wrest plank, which has had the original tuning pin holes blocked, and new holes drilled at different positions to conform to harpsichord string spacings, Dolmetsch fitted a set of old (possibly 18th century square piano) tuning pins. These which were slipping by 1974, when Feldbergs were asked by the present owner to remedy the problem, which they did by bushing these holes with soft dowel (seemed to be modern piano hammer shanks) and re-drilling the new holes right through the wrest plank and fitting modern steel zither pins driven right through the plank, projecting only 12mm above the plank and about 5mm below. The pins did not hold. My remedy was to drill the holes so that the soft bushing material was removed. Some plugs of old oak were made to fit these holes exactly, so that the grain of the plugs was in the same direction as that of the oak of the wrest plank. The plugs, made with a commercial plug cutter were only 8-10mm long, so the plugs were inserted with glue one after another with the grain angle altering by a few degrees each time….. the top, 5-6mm deep plug was aligned with the grain of the wrest plank veneer. I felt that the use of hard old oak for this layer rather than pine to match the veneer was justified. New traditional tapered tuning pins were made from 3.5mm nails. and were drilled completely within the new plugs. The ring of oak visible around the pins is not intrusive, and the pins hold well.